The Knocks performed a rhythmic and fun set paired with a beautiful arrangement of lights during a “private”, yet free show played outside of their current tour dates. The Knocks are a New York City electronic music duo consisting of Ben “B-Roc” Ruttner and James “JPatt” Patterson. They’re classified as an electronic/dance duo but take from Funk, Pop and Rock. The concert location was set at Hickory Street Annex on Thursday, Aug. 24th, a two-story venue suited for private events. Spectrum and Pandora sponsored this event for free for anyone’s enjoyment. It was not widely promoted so it reduced the number of people who showed up. Limited amount of people made it feel like a “secret” show, ultimately making the show feel more personal and better overall. As I walked in I was greeted by a promoter who was handing out these colorful LED light up foam sticks that brought an ambience to the experience. Walking up the stairs of the venue, a beautiful arrangement of light fixtures and lit up table pedestals seemed to be a hit amongst the guest in the venue. Gilligan Moss, another dance/electronic music duo, took the stage as the opener. They played an arrangement of beats that brought energy to the crowd and put everyone in the mood to dance. Hearing their set list was enjoyable despite never hearing them beforehand. After eagerly waiting, The Knocks took the stage without any big entry and immediately began to jam out. The crowd began to gather around closer to the stage and smiled with enthusiasm. Groups in the crowd closed their eyes, lifted up their arms and sang along while dancing with excitement. The crowd seemed to enjoy the flow and good vibes from The Knocks. The group members made sure to give it their all by clapping along and extending out their hand to greet their fans. 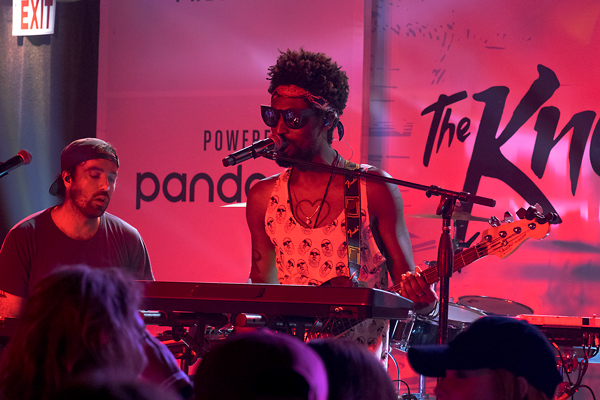 The Knocks put on a great show full of energy while also giving a laid back, feel-good attitude. I loved that one of the promoters was having as much fun we were, dancing along with the music. Overall, the concert was enjoyable, fun and filled with energy. Anyone who enjoys electronic dance music should definitely check out these two duos. They may be relatively under the radars, but they have already showcased the ability to make successful music, and with concerts like the one on Thursday night, they’ll never lack committed loyalty from their fans.